In 1953, the AC Ace sports car was launched as a two seater convertible. It was hand built, with aluminium body panels fitted to a frame comprised of steel tubing. Early models were fitted with AC's own 2 litre, straight 6-cylinder, overhead cam engine, that was originally designed in 1919. In 1956, Bristol Cars made available their own 2 litre, in-line 6-cylinder engine, with three SU carburettors, as an alternative unit. Production of the Ace continued with this engine until 1961, when the unit was withdrawn by Bristol. That same year, a Ruddspeed tuned 2.6 litre, in-line 6-cylinder engine, as used in the Ford Zephyr saloon, was fitted to the Ace sports car. This unit produced 170 bhp, had a top speed of 130 mph, and was capable of 0-60 mph in 8.1 secs. Furthermore, prior to fitting the 2.6 litre engine, AC had made a number of modifications to the Ace chassis in anticipation of adding a still larger engine, such as a 3.6 litre unit. This also included restyling the front section of the body to make allowances for the increased size and weight of the larger engine. Whilst racing in Europe and the Americas in the 1950's, Carroll Shelby's ambition was to create the world's fastest sports car. However, following his 1959 Le Mans win for Aston Martin, he was forced to retire on health grounds. When Bristol announced they would discontinue their 2 litre engine, it left the AC Ace potentially without an engine. In September 1961, Carroll Shelby, a US car designer and race driver, on hearing this, approached AC with a request to modify an Ace so that it could accept a large V8 engine. Having been given the go ahead by AC on the proviso that he found a suitable engine, Shelby first approached Chevrolet. This request was rejected, since Chevrolet felt that this would provide unnecessary competition for its own Corvette sports car. On the other hand, Ford was very interested, and was keen to be involved with a car that would compete with the Corvette. Later that year, Ford allowed AC to use their new lightweight 221 ci V8 engine. In the meantime, AC turned to earlier engineering drawings for an AC Ace fitted with a 3.6 litre (221ci) engine. Consequently, AC produced the first AC Cobra with a Ford 221 ci V8 engine, which was the same size, externally, as the Ford 260 ci V8. In 1962, the existing chassis was modified, and this prototype chassis CSX2000 was fitted with a 260 ci HiPo (high performance) Ford V8 engine and Borg Warner all synchromesh four speed gearbox, on loan from Ford in the UK. Following testing and further modifications of this prototype, the engine and gearbox were removed and, in February 1962, the chassis was sent by air to Shelby's Los Angeles assembly workshop. Upon receipt, a 260 ci Ford V8 engine and gearbox were fitted, and road testing of the first prototype got under way. In April 1962, the first AC Cobra, with chassis CSX2000, was introduced at the New York Motor Show where it was a great success, with orders coming in faster than Shelby could build them. Although the car was called the AC Cobra sports car in the UK, in the US, it was better known as the Shelby Cobra. 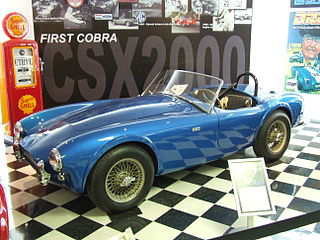 Body styling of the early Cobras was almost identical to the AC Ace, apart from a smaller grille and flared wheel arches, on the former, to accommodate wider tyres. Throughout its life, the Cobra's chassis was never rigid enough to handle the cars' massive torque, which made it all the more challenging to drive. The 221ci (3.6 litre) Ford Windsor V8 engine, in standard form, fitted with a two barrel carburettor, and with a compression ratio of 8.7:1, developed 145 bhp at 4400 rpm, and 216 ft/lbs of torque at 2200 rpm. This unit was discontinued in 1963. On the other hand, the 260 ci (4.3 litre) Windsor V8 engine had a larger bore, and a compression ratio of 8.8:1. It weighed slightly more than the 221 unit, and developed 164 bhp at 4400 rpm, and 258 ft/lbs of torque at 2200 rpm. Early Cobras used the HiPo version with raised compression, more aggressive camshaft timing, and a four barrel carburettor. This engine developed 260 bhp at 5800 rpm, and 269 ft/lbs of torque at 4800 rpm. This unit was phased out in 1964.